I am committed to your positive buying experience. I appreciate your courtesy! Painting 8” x 1 2”. In v er y go od condition. Picture 12 ” 9”. Ve ry good conditionoriginal watercolors ig ne d by p ai nt er. THE SIZE IS 13" X 15". SLIGHT PAPER WAVES OTHERWISE THE CONDITION IS GREAT. Vintage Chinese Watercolor BOY ON WATER BUFFALO decorative Painting 28" by 23"
The condition is very Good. Local; pic up available. ARTIST OF LEE PING. 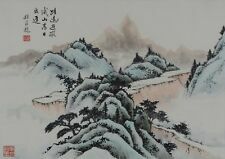 CONDITION : THE 3 PICS CHINESE SCROLL WATERCOLOR PAINTING IN FINE ORIGINAL CONDITION, ARTIST OF LEE PING MARKED. This is an original 1950 Watercolor, not a modern print. Subject: Asian Art. It is very skillfully painted and shows the liveliness that the recent tourist paintings lack. It is missing the wood dowels and has fraying to the paper at the top and bottom there is also a small tear in the painting (shown in the last photo from the back as it is difficult to see from the front). THE SIZE IS 18"3/4 X 27". SLIGHT SPOTS, WEAR AND WRINKLES OTHERWISE THE CONDITION IS VERY GOOD. Publisher; Foreign Languages Press ; Peaking 1956. Contemporary Chinese Paintings - folio album. Title ; Contemporary Chinese Paintings. visible on photo section.Each plate is loose, having number & title printed. THIS PAIR OF CHINESE PAINTINGS ON SILK DEPICT BIRDS AMONG FLOWERS AND PINES. BACKS HAVE A BLACK CLOTH COVER. PAIR IS IN AS FOUND CONDITION; THE PAINTINGS LOOK GOOD AND COLORS BRIGHT AND NOT FADED. THE BRASS CORNERS ON BOTTOMS HAVE CORROSION; EITHER FROM STORAGE OR TOUCHING. Eagle on the rock, fighting the stormy wind;. With Two Cranes diving off of a cliff into the sea. Beautiful hanging Chinese Scroll 10,000 Seas. The painting is 16" x 40 1/4". The scroll is 21" x 72". CHINA CHINESE LENIN SILK PORTRAIT PICTURE. Made of Silk. Chinese Silk Scroll Painting - Signed Mountain and River - 62.5" x 16.75"
Gorgeous painting of mountains and river. Scroll is made of silk. You should buy this scroll! There are two small tears on the corners where the scroll connects to the rod. THE SIZE IS 9"3/4 X 14". SLIGHT AGE TONING SEE PICTURES OTHERWISE THE CONDITION IS VERY GOOD. SOLD AS SHOWN. Title : Beauty. It does not receive cancellation for a reason. They have age appropriate flaws. Chinese scroll painting by kong xiao yu (孔小喻） 13“ x 52" painting, overall size around 90" x 21". 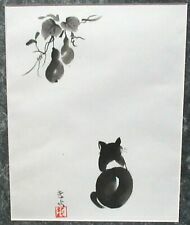 good Chinese scroll ink hand painted painting by kong xiao yu. ). Artist signed. Beautiful colors and details. Fee for this service dependent on size and if i need to bring help. We can always discuss costs. Wear Consistent with Age. Minor signs of age and use consistent with age. Would make a great addition to your collection! Chinese Hanging Scroll painting, by Hong Kui 洪奎 "Many Shrimps"
Signature and Seal = 洪奎, Hong Kui. Scroll Box =None. Full size of the scroll: 53 cm x 156 cm = 20.8" x 61.4". If you need other options such as second floor or multiple locations you must let us know before we get your quote. We are open Sat. SHOWROOM NUMBER 609 261 0602. Artist signed and dated on 1966. total scroll size: 17"x60". image size 13"x27". great condition. 颜真卿书法学会始终以推动两岸书学和文化交流为职志，迄今已先后赴大陆的郑州、厦门、长春等多个城市举办了多场作品展。学会多年不懈所致力的推动两岸文化交流的事业，受到了两岸书法艺术爱好者以及社会各界的高度赞誉。. Made of a single piece of green hard stone, possibly marble. Etched characters up front, most likely a poem. Here is a beautiful Chinese scroll weight. Chinese in origin, mid 20th century. Green felt on underside. I believe they are acrylic paint, its no oil. Signed by the artist, the painting is in excellent condition. This is part of my grandmothers estate, she loved Chinese paintings, and traveled all over to find them. Fine original painting, it is signed and has a date that appears to be 1972. Review all Photos. This piece is in very good condition with very limited foxing. NO RESERVE. You are looking at a Chinese Hand Carved Hard Stone Panel. This panel is around 12.25” tall, 16.5” wide. The panel has jade and other hard stone. 20th Century Chinese Watercolor Scroll Painting on Paper Boy Cow Gold OOAK ART This is a wonderful hand painted Chinese scroll from China. It is an original, one of a kind piece of art and is a great decorative piece. There is some light staining towards the top and bottom of the scroll. Paper width = 21" Length = 51 1/2" Total scroll length = 24 1/2" Shipping within 1 day of cleared payment. International Buyers - Please Note: Import duties, taxes, and charges are not included in the item price or shipping cost. These charges are the buyer's responsibility. Please check with your country's customs office to determine what these additional costs will be prior to bidding or buying. Thank you very much for bidding [Sign up for my email newsletters] (https://my.ebay.com/ws/eBayISAPI.